CATARMAN, Northern Samar – Two persons were killed and another two were wounded after an explosion hit their rented house in Barangay Bobolosan, Laoang town in Northern Samar on Thursday(Nov.22) afternoon. The police identified the fatalities as alias “Ome” and alias “Gaga”, both residents of San Antonio town in this province. 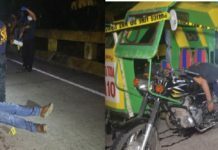 While the injured were identified as Junjun Donato, 32, and Nilo Cuanico, both residents of Purok 9 Poblacion, Lope De Vega. Ome died on the spot while Gaga died while being treated at the St. Scholastica Hospital in Pambujan town. Laoang town police chief, Chief Inspector Manuel Castillo, told Leyte Samar Daily Express that the explosion happened around 3:40 pm Thursday inside a house owned by Natalia Capas but was being rented by one Dario Ayes, said to be a former policeman. It was not yet established what is the relationship of Ayes to the victims. The explosion was so huge that it was reportedly heard by residents in the neighboring barangays. An employee of the Department of Public Works and Highways-second district Engineering Office situated in Brgy.Burabod, two kilometers away from the scene of the incident, said their office was shaken due to the impact of the explosion. The investigating team from the PNP Explosive Ordnance Division (EOD) recovered hundreds of blasting caps, a sack of detonating cords and time fuse. These are materials that are used in making improvised explosive device (IED) according to the military. The police are still investigating the kind of explosive that blew up which killed and wounded the victims. 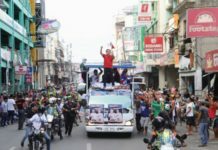 Donato, Cuanico, and Ayes were detained at the Laoang Police station as they are considered suspects in the incident. PO2 Eleazar Diu, investigator- on-case, said they would be filing charges against the suspects for violation of sections 1 and 2 of Republic Act 9516 on illegal possession and manufacture of explosives.